East Carolina University School of Dental Medicine (ECU SoDM) hosted an inaugural charity care event on March 18–19, designed to reach adults in the greatest need of dental care. A new initiative, ECU Smiles, was held at the school’s community service learning center in Elizabeth City, NC—one of eight dental education and care centers operating in rural and underserved areas across the state. The effort marks another way to advance the school’s mission of educating students while supporting North Carolinians who lack access to primary health care services. Access to dentists is a problem for many North Carolinians. The state ranks 47th nationally in the number of dentists per capita. Outside of North Carolina’s 20 urban counties are 80 rural counties where 40% of the state’s population lives. Yet, rural counties have about half the number of dentists as urban counties per 10,000 people. 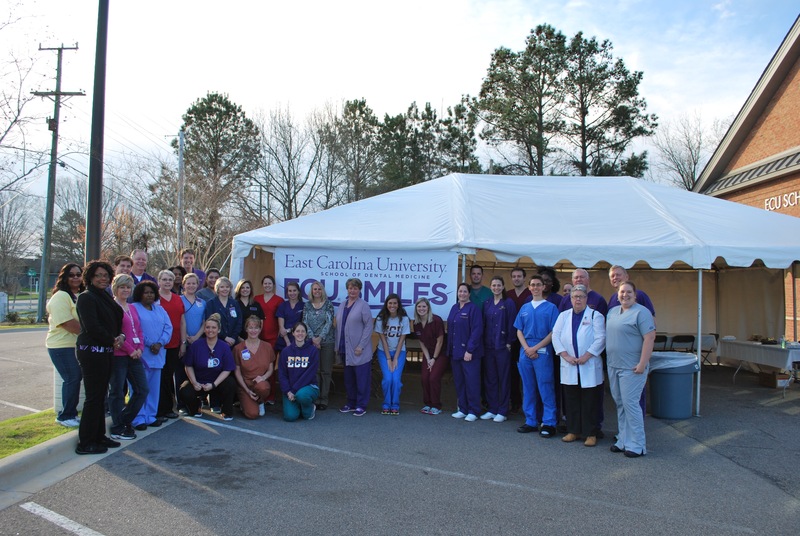 While the dental school’s faculty, students and residents delivered the care at ECU Smiles, the ECU College of Nursing and several local partners supported the event. “We are especially grateful to our Elizabeth City partners for identifying and contacting the patients. Local partnerships were essential for reaching those most in need in their community,” Dr. Scholtz says. Elizabeth City is approximately 90 miles northeast of the dental school. With faculty, fourth-year students and residents serving North Carolinians at centers in Ahoskie, Elizabeth City, Brunswick County, Davidson County, Lillington, Robeson County, Spruce Pine and Sylva, the school is well positioned to offer ECU Smiles in other locations.